Synergy is the phenomenon that, when the parts of a whole share elements between them through which they interact, the whole becomes more than the sum of parts. The whole — three triangles of three matches each — is equal to the sum of parts (nine matches). Three times three equals nine. 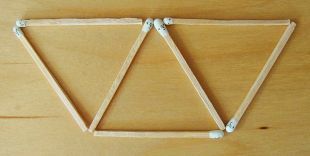 Now, the whole — three triangles of three matches each — is greater than the sum of parts (seven matches). Three times three is nine, which is two more than seven. The sharing, as it were, produces two extra matches on the wholistic level that have not actually been laid on the level of parts. There is a synergistic bonus of two-seventh, thanks to the double function performed by two of the matches. And yes, an ever greater bonus can be obtained by making a three-dimensional figure consisting of four triangles with only six matches in total; but for the sake of demonstrating synergy, the above two-dimensional analogy suffices. The way in which conscientiousness, intelligence, and associative horizon interact may involve a synergistic process similar to what is visualized above, so that the resulting personality is greater than the simple sum of abilities and traits of the individual. Intelligence can be thought of as being visualized by the middle triangle, sharing a side with each of the other two which stand for conscientiousness and associative horizon. One may imagine that conscientiousness contains a subdivision of traits that are ability-fostering, that help one to use one's intelligence, while on the other hand intelligence itself is needed to be able to make meaningful use of these traits in the first place. These personality traits form the interaction between conscientiousness and intelligence; they lie just outside of the cognitive domain, but allow and foster cognitive functioning, or actually any use of one's abilities at all. They add to both conscientiousness and ability, count double as it were. They perform the double function that is essential to synergy. Associative horizon too includes a subdivision of elements that border on the cognitive domain, to wit the divergent and lateral abilities. While these abilities are not full aspects of intelligence in themselves — their output may be nonsense as well as valuable — they provide the rational intellect with the occasional good idea, the "spark of inspiration", provided the intellect is able to distinguish the rare "sparks" from the constant stream of random noise and delusions put out by an active lateral mind. For completeness one may see the four non-shared matches that point left and right as the remaining subdivisions of conscientiousness and associative horizon, and the bottom match as representing measurable ability, intelligence. One is reminded there is no fundamental difference between psychometric intelligence (the general factor in mental testing) and "other" types of ability; all ability types can be thought of as part of a pyramid or hierarchy shaped by their intercorrelations, the concept of factor analysis not being restricted to mental abilities (hence the quotation marks around "other" in this sentence). The thus interactive parts — conscientiousness, intelligence, and associative horizon — together result in a personality that awarely creates, not just as in writing a novel or knitting a sock, but also through verification of the world whose existence depends on aware individuals; they are the verificators who create existence itself. Although one should never take a visual analogy too far to not let it curtail reality which tends to be more complex than the analogy, it is possible to visualize the aware creative act as a fourth triangle pointing downward from the middle one and completing the fifth, larger triangle that represents verification and therewith existence.